Our core values are driven by a desire to nurture and develop meaningful relationships with all members of the Lightbridge Academy family, never forgetting that C-H-I-L-D-R-E-N are at the center of why we are all gathered together. Creating happy memories in a joyful environment. Being honest and respectful in all relationships. Set the example for all others to follow. Build meaningful relationships while recognizing accomplishments. "good enough" by continuously improving and embracing change. Each family member in a supportive and positive environment. Just as every point on a circle is equidistant from its center, each person whose life is touched by Lightbridge Academy is equally important. At the heart of our Circle of Care is the child. Surrounded by care, guidance, and the early-childhood educational expertise of our staff, no area of a child's safety or development is left to chance. The needs of working parents are equally important as the care and education of their children. We strive to earn your trust and create a meaningful and life-enhancing relationship with you, one that will help you meet the challenges of balancing work and life. On the front lines and never forgotten, we pay special attention to our educators. We want them to be deeply engaged, continually growing, and remain with us for the long term, which means the world to parents and children who delight in seeing familiar faces every day. Our relationships extend beyond the four walls of our child care centers through supportive partnerships and participation within the communities we serve. Our goal is to be a valuable asset in every community. 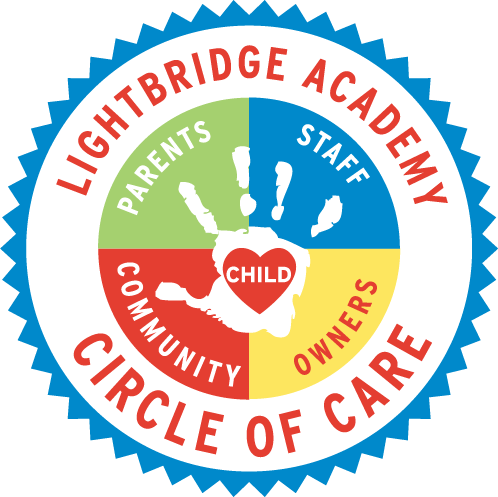 Lightbridge Academy franchise owners are selected with great care, and must share our core values and understanding of the transformative role they play in the lives of all staff and families. You can expect to find the same values shining through from center to center. From the first hello of the day, to the last good-bye, we want every child to feel safe, nurtured, and excited to learn and grow with us, and for you to consider us a true partner in the development and education of your child. We go beyond what's expected, creating a one-of-a-kind educational experience for the children we care for and the families who cherish them.